The Barbie Blog: Have a Holly Jolly Christmas! This will be the last post before Christmas. Just too much to do! The majority of my 'work' has been keeping my hands off the pan of Sugar Cookies I just made. ;) I gained 6 pounds in 2 weeks! I better watch out! But my doctor did tell me that at week 32 of pregnancy, most of it is water weight. Whew! Well, I finally got around to gluing the bustform into the base and fixing up the tape around her legs. And the weight of the bustform worked with the cardboard base. I mentioned in the post, don't use electrical tape as it slides down the vinyl. I bought some black duct tape and used that. I need to work on making it look pretty. 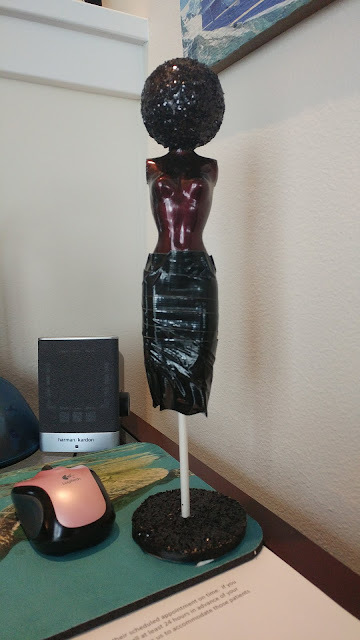 The top of the bust was supposed to be black but I didn't have any black nail polish and didn't feel like using a bunch of black acrylic paint and loads of varnish so I used a black cherry color. So what do you think? Another word of note: if you plan on putting a dress on the doll that you have to side up over the legs, do it BEFORE gluing the bustform into the base. This one will be forever naked unless I find a dress that is completely open in the back. Not likely. HA! You can read about the craft project in this post! 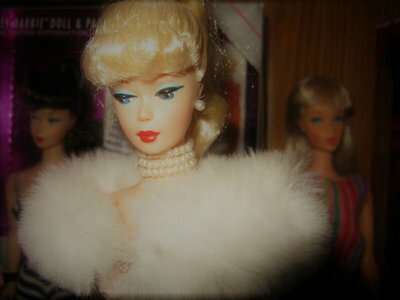 Also, did you know that I made a 25 days of Barbie post back in the day? I started on December 1st and I had exactly 25 Holiday Barbie dolls (at the time) and did a post each day! It's a fun read so if you want to go back, they start with the most beautiful White Winter Wonderland - 1989 Happy Holidays Barbie. From there click "Newer Post" at the bottom and they go in order. You can also check out the holiday dolls I've received after the 25 days of Barbie! *EDIT* Apparently the "newer post" link does not show up on the bottom of the 1989 post. If it doesn't and you want to read the rest of the posts, go to the home page and click on "2012" and then December. There they are! Once you click on Day 2, you can then click "Newest Post." Sorry about that! And as mentioned above, here are the links to the posts about the other holiday dolls I've received since the 25 days of Barbie! I hope that you and your families have a very wonderful Christmas and holiday season! Live it up, do something nice for yourself and enjoy all this season has to offer! Great project! Have a wonderful Christmas too, best wishes! Well done in saving your dress form. Merry Christmas to you and your loved ones!